For many children and teenagers of the 1990s, Linda Ellerbee might have been the first news anchor we learned to trust. Never one to avoid covering complex issues in terms kids can understand, Ellerbee is hosting a special Nick News on the lives of gay children. 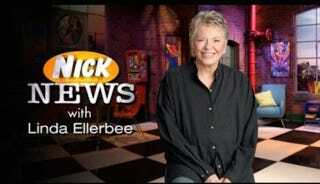 Nick News With Linda Ellerbee: Coming Out will follow will follow a group of gay children through their daily lives, showing how they deal with harassment, abuse, ignorance, and violence along with the normal trials and tribulations which go along with growing up, according to the network's press release. The release also says that the program will look at ways that both gay and straight teens can fight bullying and ignorance, and it includes a statement from Ellerbee herself on the program. It takes bravery for a kid to come out. Being accepted by straight people is not a given. Being young and 'different' is not easy. This may be tough to talk about, or hear about, but this is important stuff. Not addressing it doesn't make it go away. Over the past two decades, Ellerbee has covered a wide range of complex topics on Nick News, and she was definitely a trusted voice to me during my preteen years. Although one of the most respected television journalists of the last few decades, it is her particular approach on Nick News which stands out: she approaches issues first and foremost from a child's perspective. In a world where so few adults bothered to listen to me or to explain to me, especially when I didn't quite understand major issues, I could rely on Nick News and Linda Ellerbee to give me enough information to make an educated conclusion and to feel secure in that viewpoint. I imagine she was to me as a child, who Walter Cronkite was to my mother. This special isn't the first time the program has covered issues of sexual orientation, including giving a platform to children with gay parents, as well as their opponents (such as Jerry Falwell), and including openly gay parent Rosie O'Donnell. Although Ellerbee and the network received criticism from conservative (and pretty blatantly homophobic) groups, the news anchor seemed scrupulously even-handed from what I remember (as I definitely watched it), and Ellerbee's primary motivation seemed to be anti-bullying, not necessarily a debate on sexual orientation itself. It's about not name-calling. It's about stopping violence. The special will air on Tuesday, Oct. 7, at 8:00 p.m. (ET/PT) on Nickelodeon, which coincides with the 26th annual National Coming Out Day later that week.